Hey everyone, welcome back to my vehicles blog. I hope you all enjoyed the holidays, I had a great time with the family all coming out to visit. My nephew just turned 17 this summer, so the rest of the family all chipped in and found a cheap Mazda 3 hatchback that made the perfect gift. We found it online, and it was actually no hassle at all to get all the information sorted out with Mazda and get the car here in time for Christmas. He absolutely loved the car, and I was really glad that we could make sure he got something safe and reliable for his first car. The Mazda3 was actually the first car I learned to drive on other than an old farm pick up, so I am glad we can continue this tradition, even if he did get a 2016 version. It isn't often that a vehicle is able to successfully combine style, dynamics and value all in one little deliverable-by-Christmas-day package, but Mazda finds a way to do it year after year. You get the standard choice of hatchback or sedan still, and can also choose from the standard slick 6 speed manual transmission and a 155 HP 2.0 litre, or from the upgraded 2.5 litre 184 HP 6 speed automatic transmission. The great handling and responsive steering will have anyone who drives this car dreaming of a long, winding road. Even if you go with add ons such as navigation system, heated seats or even traffic sign recognition won’t break the bank. Mazda has done a little shuffling with the Mazda 3 this year, trying to make it a less confusing model to purchase. The different trim types have been removed, and many of the advanced safety features previously saved for high end models are now in the basic packages. They also introduced their G Vectoring Control, a feature 8 years in the making that can help the driver navigate around slopes and corners, following the path set by the driver while keeping it more of a straight line. Cabin noise has also been reduced whilst the drivetrain has remained the same, although the change is only a single decibel. 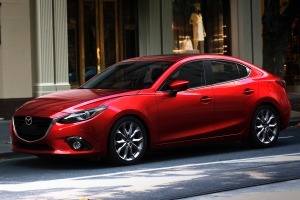 Mazda has for a long time been famous for making vehicles that are simply fun to drive. A lot of this is because of the famous MX-5 Roadster, which is a front runner for best selling sports car in the world and one of the most fun cars to drive at any price point. To anyone getting excited reading about the MX-5, you will be happy to know that a lot of the components and characteristics that make it such a fun car have been implemented in this years Mazda 3. If you take the Mazda 3 through some corners, you will instantly feel that this is the same team behind that famous roadster. You get the feeling that all four wheels are sharing the load equally, giving a feeling a near perfect balance on the road like a go-kart on the track. Yet these twisty roads do not have any negative effect on the interior. As I mentioned earlier, there are a couple different options when looking at the engines of the years Mazda 3. 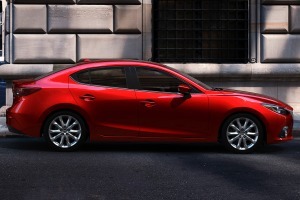 No matter what engine you choose, the Mazda 3 is fast, especially the 2.2 litre diesel engine. This engine packs a whopping 148 BHP and can get from 0-62MPH in only 8 seconds for the saloon, 8.1 for the hatchback. It is also the most undisesely-diesel there is, giving an extremely smooth ride so you don’t know if you're driving a diesel you may just think that the engine is ticking over. Even though it is barely noticeable, Mazda added an additional sound dampening device to reduce vibration, while other changes offer slight increases in throttle response. The 2.0 litre engine is expected to sell better than any others however, as it can still achieve 62 MPH in about 8.9 seconds. The Mazda 2 is not the number one most economic car in its class, but with its performance in every other category this is something you can let slide. It has never been hard to find more fuel efficient family hatchbacks, but when you consider the actual size of the engine and how fast it can get to. The most economic version is the 1.5 litre diesel, which returns 74.3 MPG and 99g/Km of C02. The automatic gearbox has a negative effect on this of course, but Mazda does offer some add ons to counter this. So that is my little Mazda 3 review, I hope you guys found it informative. If you liked this, then read my last article about car stereo deck. Have a great weekend everyone.